I absolutely love carbs… bread, pasta, bread with pasta… I always like to have a side of bread when we have pasta or soup for dinner. Unfortunately, I don’t normally plan far enough in advance to make my own bread, and I don’t want to run to the store just to buy bread. One of these days, I’ll plan ahead. There are way to many yeast bread recipes I want to try! 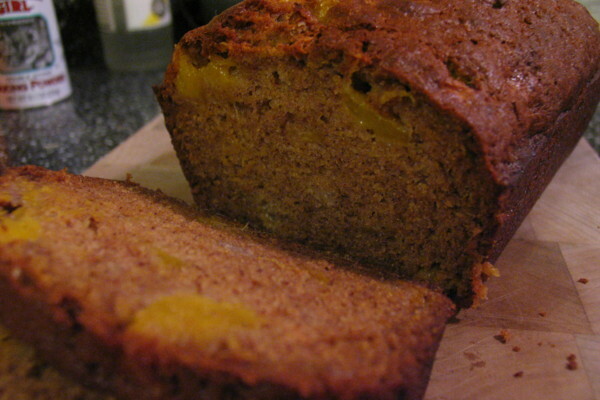 In the meantime, I’ll stick to my quick breads. 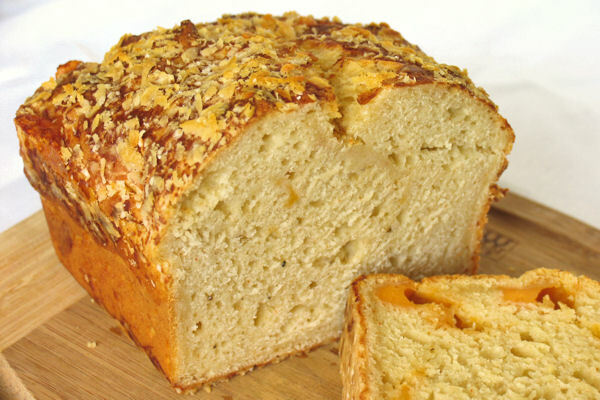 🙂 This cheese bread is a wonderful savory quick bread, so it’s a perfect accompaniment to pastas and soups! Preheat oven to 350 degrees F. Coat a 9×5-inch loaf pan with nonstick cooking spray, then sprinkle ½ cup Parmesan cheese evenly over the bottom of the pan. In a large bowl, whisk together the flour, baking powder, cayenne, salt and pepper. Using a rubber spatula, fold in the cheddar until all the cheese is well coated with the flour mixture. In a medium bowl, whisk together the milk, butter, egg and sour cream. Gently fold the wet ingredients into the dry until just combined; do not over mix. 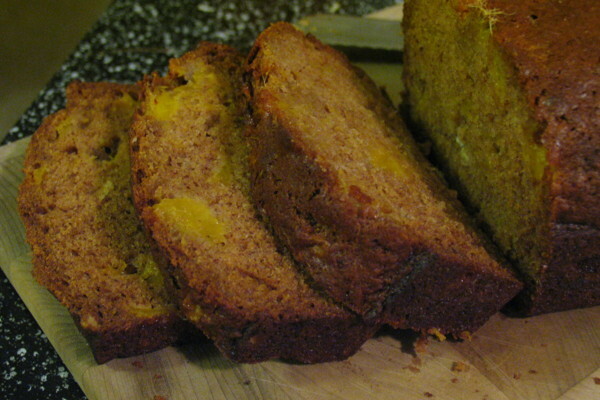 Pour the batter into the prepared loaf pan, smoothing the top with the rubber spatula. Sprinkle the remaining Parmesan evenly over the top of the batter. Bake 45 to 50 minutes, or until deep golden brown and a toothpick inserted into the center comes out clean (keep in mind when testing for doneness that a pocket of cheese may look like uncooked batter). Cool in the pan on a wire rack for 5 minutes, then turn out and cool completely before cutting. It may not be zucchini season anymore, but I found some pretty zucchinis for a good price so I couldn’t resist! Plus, it has chocolate… and Kahlúa. I loooove Kahlúa!! And chocolate! Put it all together, and you have an amazing bread. It’s moist and flavorful. Plus, Kahlúa is coffee liqueur, and coffee means breakfast, hence we have a perfect breakfast bread (it’s okay, the alcohol is burned off anyways)! Preheat oven to 350 degrees F. Grease an 8½x4-inch loaf pan; set aside. In a medium bowl, sift together flour, baking soda, and salt; set aside. In a large bowl, combine oil, sugar, and eggs. Whisk to blend, then add Kahlúa. Add flour mixture and stir until just combined. 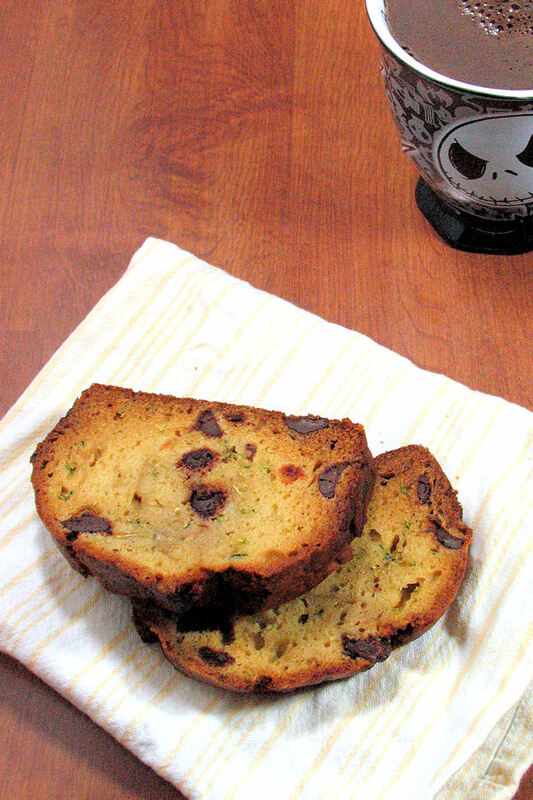 Gently stir in zucchini and chocolate chips until evenly distributed. Pour into prepared loaf pan. Bake for 1 hour and 10 minutes, or until wood pick inserted in center comes out clean. Cool in pan 10 minutes then turn out onto wire rack and finish cooling. Yes, I realize that it isn’t fall, and it’s not the holiday season. But I’m the kind of person who loves pumpkin throughout the entire year. Call me devoted, I guess! It’s such a comfort food, especially when combined with the warmth of cinnamon, nutmeg, clove, and ginger. Besides, pumpkin is a super food, so it’s good for you to eat year-round, not just around the holiday season. Being a super food means that it is high in nutrients that help fight disease and increase overall health. Pumpkin is also one of the tastiest sources of fiber! 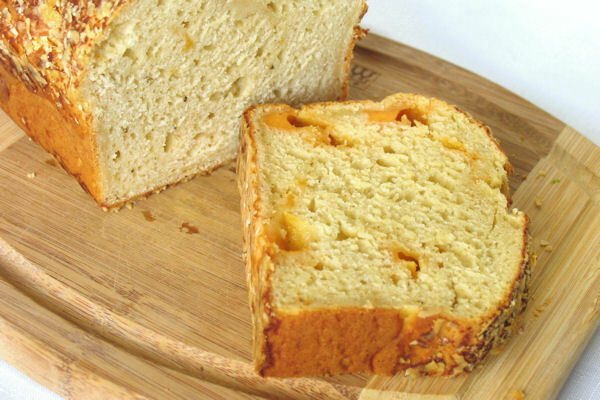 Like most quick breads, this bread is super easy to throw together. 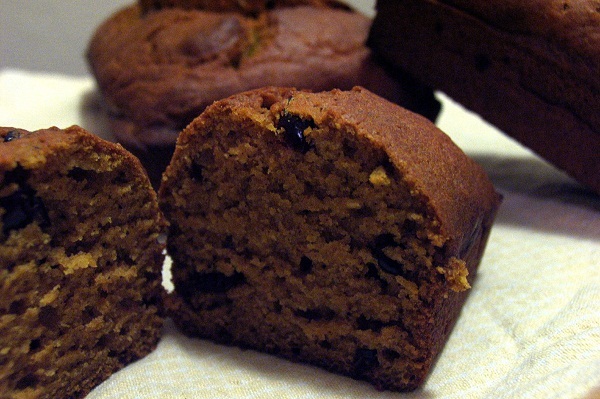 It has an intense pumpkin flavor with the sweet yet tart flavor of cranberries interspersed throughout the loaf. Be adventurous and have a little pumpkin in July! 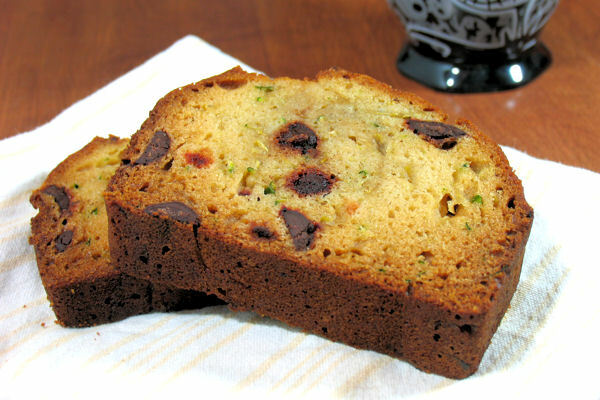 Note: Cranberries may be substituted with chopped walnuts or chocolate chips, or completely omitted. Preheat oven to 350 degrees F. Spray cooking spray into two 9×5 loaf pans or 6 mini loaf pans. 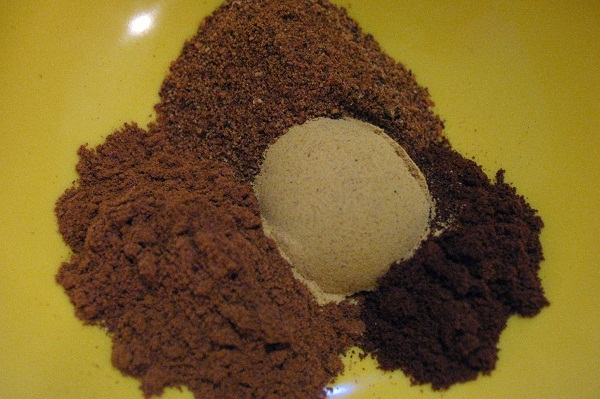 Sift together the flour, baking soda, salt, cinnamon, nutmeg, ground cloves, and ground ginger. In a large mixing bowl, combine the pumpkin puree, oil, water, eggs, and sugar. Slowly add the dry ingredients and dried cranberries; mix until smooth. Split batter equally between prepared loaf pans. Bake bread for 1 hour to 1 hour 10 minutes, or for 40 to 45 minutes if using mini loaf pans, or until toothpick inserted in center comes out clean. Cool bread in pans on a wire rack for 10 minutes. Remove bread from pan, invert onto rack and cool completely before slicing. Preheat oven to 350 degrees F. Grease a 9×5″ loaf pan. Combine flour, baking soda, spices, and salt in a large bowl. Whisk to combine and make a well in the center of the dry ingredients. 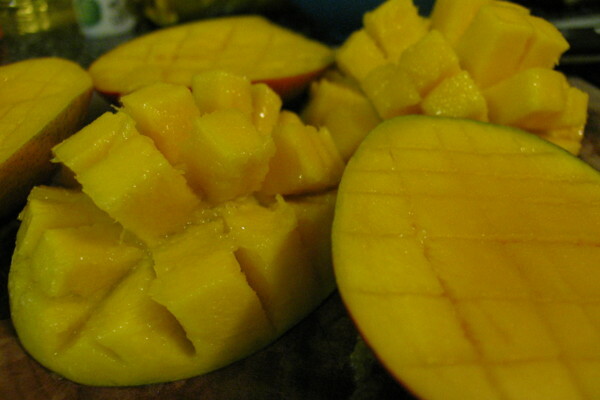 Add the eggs, oil, sugars, vanilla, and mango to the well. Stir to combine, until just mixed. Pour into the loaf pan. Bake for 1 hour, or until a toothpick inserted in the center comes out clean. Let bread cool for 10 minutes in the pan, then remove and cool completely on a wire rack before slicing.